The process of aging affects every aspect of the physical and cognitive domains. Every system in the body deteriorates including motor function with a decline in strength, flexibility, and balance. Impaired balance is a particular problem as it can lead to falls. In the U.S. one third of people over 65 fall each year and 2.5 million are treated in emergency rooms for injuries produced by falls. About 1% of falls result in deaths making it the leading cause of death due to injury among the elderly. It is obviously important to discover methods to improve balance and decrease the number of fall in the elderly. Tai Chi training is designed to enhance and regulate the functional activities of the body through regulated breathing, mindful concentration, and gentle movements. It includes balance training and has been shown to improve balance and coordination. Because it is not strenuous, involving slow gentle movements, and is safe, having no appreciable side effects, it is appropriate for an elderly population. So, it would seem that tai chi practice would be well suited to improving balance and coordination in seniors and thereby reduce the likelihood of falls. In today’s Research News article “Effect of Yang-Style Tai Chi on Gait Parameters and Musculoskeletal Flexibility in Healthy Chinese Older Women.” (See summary below or view the full text of the study at: https://www.ncbi.nlm.nih.gov/pmc/articles/PMC5968961/ ), Zou and colleagues recruited elderly women (> 65 years of age) and randomly assigned them to either a Tai Chi practice or no-treatment control conditions. Tai Chi was practiced under the supervision of a Tai Chi master for 90 minutes, 3 times per week for 8 weeks. They were measured before and after practice for physical activity and hip and foot flexibility. They also walked a short distance and their movements of the knee, hip, and ankle were analyzed through a kinematic analysis. They found that the Tai Chi group and not the control group after the 8-week practice period had significant improvements in their walking including stride length, gait speed, stance phase, swing phase, and double support time. They also had significant improvements in their hip and foot flexibility and range of motion of the knee, hip, and ankle. No adverse events as a result of Tai Chi practice were reported by the participants. These findings conclusively document the ability of Tai Chi practice to help maintain the flexibility and range of motion of elderly women. This is particularly important as it suggests that these women would be less likely to fall and maintain a high quality of life. In addition, as Tai Chi is gentle and safe, is appropriate for all ages including the elderly and for individuals with illnesses that limit their activities or range of motion, is inexpensive to administer, can be performed in groups or alone, at home or in a facility, and can be quickly learned. In addition, it can be practiced in social groups. This can make it fun, improving the likelihood of long-term engagement in the practice. So, Tai Chi practice would appear to be an almost ideal gentle exercise to maintain the health and well-being of the elderly. So, improve movement and flexibility in older women with Tai Chi. The purpose of the present study was to examine the effect of Yang-style Tai chi (TC) on gait parameters and musculoskeletal flexibility in healthy Chinese female adults. Sixty-six female adults aged >65 years were randomly assigned to either an experimental group (67.9 ± 3.2 years of age) receiving three 90-min simplified 24-form TC sessions for eight weeks, or a control group (67.4 ± 2.9 years of age) who maintained their daily lifestyles. All study participants were instructed to perform a selected pace walking for recording gait parameters (stride length, gait speed, swing cycle time, stance phase, and double support times) at both baseline and after the experiment. Low-limb flexibility and range of motion at specific musculoskeletal regions (hip flexion, hip extension, and plantar flexion, as well as anterior and lateral pelvic tilts, pelvic rotation, and joint range of motion (hip, knee, and ankle)) were also assessed in the present study. Multiple separate 2 × 2 Factorial Analysis of Variance (ANOVA) with repeated measures were used to examine the effects of TC on the abovementioned outcomes between baseline and posttest in the two groups. 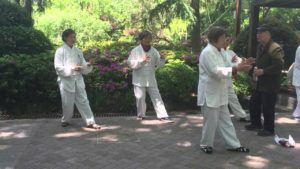 When compared to those in the control group, older female adults who experienced the 8-week Tai chi intervention demonstrated significant improvements in most of the outcome measures. More specifically, positive changes in the TC group were found, including gait parameter (p < 0.001 for all; stride length (1.12 to 1.24, +8.6%), gait speed (1.06 to 1.21, +13.9%), stance phase (66.3 to 61.8, −5.5%), swing phase (33.7 to 38.4, +10.1%), double support time (0.33 to 0.26, −21.1%)), flexibility-related outcomes (hip flexion (90.0 to 91.9, 22.6%, p < 0.0001), single hip flexor (6.0 to 2.0, −61.5%, p = 0.0386), and plantar flexion (41.6 to 49.7, +17.5%, p < 0.0001)), and range of motion (anterior pelvic tilt (9.5 to 6.2, −34.7%, p < 0.0001), lateral pelvic tilt (6.6 to 8.3, +23.8%, p = 0.0102), pelvic rotation (10.3 to 14.7, 28.2%, p < 0.0001), hip range of motion (29.8 to 32.9, +13.5%, p = 0.001), and ankle range of motion (28.0 to 32.6, +11.1%, p < 0.0001)). The present study supports the notion that the practice of TC has a positive effect on healthy older female adults in improving gait parameters and flexibility, counteracting the normal functional degeneration due to age.